CURRENT INVENTORY | HOME | KNOWLEDGE INDEX | CONSIGN WITH US | CONTACT US | OUR FACILITIES | LIQUIDATE | ESTATE AUCTION V/S ESTATE SALE | WHAT IS IT WORTH? Our process allows for hassle free off site sale of your valuable antique, valuables, collector items and common furnishings. This avoids the intrusion and liability of on site estate sales allowing you to sell and vacate the real estate in a quick and timely basis. The amount of time from first contact to pick up of your inventory averages 24 hours due to our landed facilities, warehouses and centrally located auction house and professional staff. Consiging your estate or business with Orlando Estate Auction is a professional, quick and courteous process that results in the highest possible monetary convesions due to our auction process. Our following of bidders varies from used furnishing store owners, antique store owners, collectors, online sellers, furnished residential rental unit owners, art collectors, art galleries, jewelers, coin collectors and more. The competitive bidding process between these bidders leads to higher liquidation amounts than on site estate sales and business liquidations. We ask that you submit your estate inventory for initial review using our CONSIGNMENT FORM when possible. We do understand that you may be out of state and not have full photographs to submit or other unique circumstanses, still please use this form. This submission will trigger the creation of a consignor number for use throughout your estate liquidation process. Following your form submission we will conduct an internal review and discussion and then contact you with a proposed agreemetn regarding your estate liquidation. This consignor agreement for estate sale by auction will include your consigorn number, pick up date, anticipated time needed for our load out team to pick up your estate and other pertinent information. In addition to your estate speecific details we will provide you with an anticipated estate sale by auction date and scheduled payout date. There may be items that will be best served to be donated to charity or otherwise disposed of. We will discuss this with you prior to consigment so that you are able to make informed decisions for dispersal or disposal of such items. These may include items such as upholstered sofas that have tears or are soiled, tube televisions, excessively soiled mattresses, clothing excluding furs and leather jackets, etc. These items will best benefit you with donation to a charity and its associated tax benefits. We want to insure that our consignors are well and honestly informed so that expectations are real and achieveable. If you are out of state we can make arrangemetns to transport these items to their final dispositon and the associated fees to be charged to your estate. This is most helpful to consignors who may be out of state and not have the knowledge or facilities to take care of the dispostion of these items. Our load out team will arrive within 30 minutes of your scheduled pick up time to pack, load and transport your estate sale or business closeout items to our warehouse facilities for intake and processing. Our professional load out team will take great care to pack, wrap, box and load your estate sale items into our trucks. Once your items are in our truck we use professional moving blankets, straps to secure your items for transport to our facilities. We take great efforts to avoid damaging the estate inventory or the real estate. Upon arrival at our warehouse your estate inventory will be unloaded into a specific section of our facility that has been marked with tape on the floors and vertical barriers when necessary. This process prevents any chance of your estate sale items from becming mixed with other estates or business on consigmnet. Our professional process insures that your estate sale by auction inventory is accurately marked and catalogued. Our computer printed labels are placed in several locations on your items to mark them with your consignor number. During this marking process we will wipe any dust free from items of high value to ehannce their appearance during the estate auction sale. Small items are boxed in a fashion to garner the highest bids from our bidders during our estate sale by auction. Small items are sold by box, furniture items are sold by individual piece and sets. Your items will be moved form our warehouse positions to the auciton floor on the two days poeceeding our auction. During this process we will stage items so that their position will serve to garner higher value. 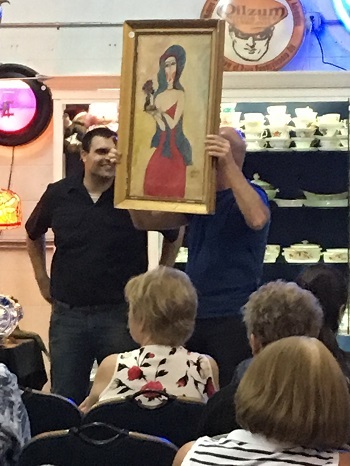 Strategic placement of your items for auction based upon the flow of our estate sale auciton will contribute to higher than estate sale pricing by displaying these items to our bidding groups. Our auction serves flea market vendors and garage sale bidders in the early hours of our estate sale auciton while along with used furniture store owners. As our auciton progresses our antique dealers and collectors are served with mid sale items and high end furniture resale store owners, art dealers, jewelers and collectors are served in the middle and towared the later hours of our sale. Integration of your items into the appropriate bidding group will increase their auction value by the competitive bidding of these bidding groups. On our estate sale by auction days (Mondays and Saturdays) we open our doors one hour prior to the sale for preview. Our bidders will examine our inventory up close to develop their shopping lists. Our sale day staff is on hand and thoughtfully placed to answer questions from bidders and prevent theft. Bidders are able to access our wifi network so that they can research item value and be well informed. This is a benifit to our consignors are bidders are aware of maximum value for online disposal yet they do not have shiping costs to consider. This all plays into each bidders individual bid process and required margin. We have store owners and regular bidders from all counties in central Florida as well as from all major cities in the state. We have collector bidders from out of state as well as state wide. Our consistant and ever growing bidder audience benefits our consignors with higher value conversions. This is not typically achieved at an on site estate sale as the typical bidder is a house wife or online store that does not have the buying power and abilities of our store owner bidders. In additon we have an Orlando Police officer on stie to insrue that no theft occurs. Our facilty is equipped with surveillance cameras that are monitored from our back office during preview and sale times. Our estate sale by auction is an absolute auction. This means that everyting will sell to the highest bidder with nothing left at the end of the sale. This absolute sale benefits our consignors as they do not have to deal with unsold inventory as they would have at the end of an on site estate sale. Our sales serve to stock hundreds of resell stores, collectors, onine store owners, flea market store owners, garage sale operators, art dealers, jewelers, and other resale vendors. 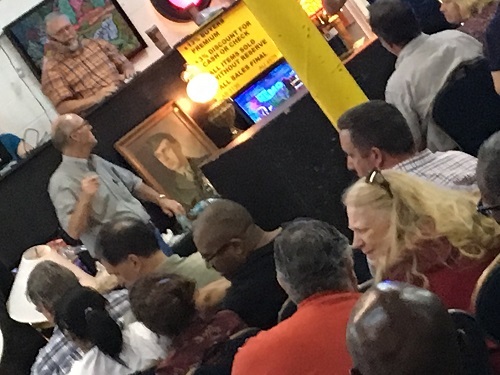 These business owners attend our weekly auctions on a regular basis and ahve permanant bidding numbers and seating in our auction house. Your estate sale inventory will be liquidated at the top dollar price through cmpetitive bidding, amounts that cannot be compared with traditional on site estate sales. It is a win win situation when you consign your estate or business closing with us. You will quickly empty your real estate, you will not expose yourslf to the liabilities of an on site estate sale, and you will convert your estate to the highest value possible in our estate sale auciton facility due to our permanant audience. Additionally you will not expose your neighbors to parking difficulties and issues of an on site estate sale. On sale day the rear of our auction house facility is lined with trucks, trailers, cargo vans waiting for loading of their purchases from your and our other consigned estates and business liquidation closeouts. Our accounting staff keeps a real time log of your consigned estate sale items as they sell at our auciton. Your consignor number, item description, sale price and winning bidder number is logged into our computerized system as each item sells. Upon completion of the sale, all items must be paid for by the bidder. Our accounting staff will tabluate and print out the total sale of your estate on a log, deduct the consignor fees and a check will be issued to you within five days of the sale. Upon receipt of your consigment payout check please take a moment to place a reviw of our estate sale by auction company on any of the available online reveiw systems. If you do not participate in online reviews a hand written note or email note is equally appreciated.